Like other porous material, Soundproof Acoustic Panel for Home Theater sound absorption coefficient increases with the sound frequency. Soundproof Acoustic Panel for Home Theater sound absorption coefficient can reach 0.8~1.1. Soundproof Acoustic Panel for Home Theater is a sound deadening material of high performance. Acoustic Board is noise absorption, thermal insulating, elastic, wear resistant, hard to tear. Acoustic Board has excellent decorative effect. 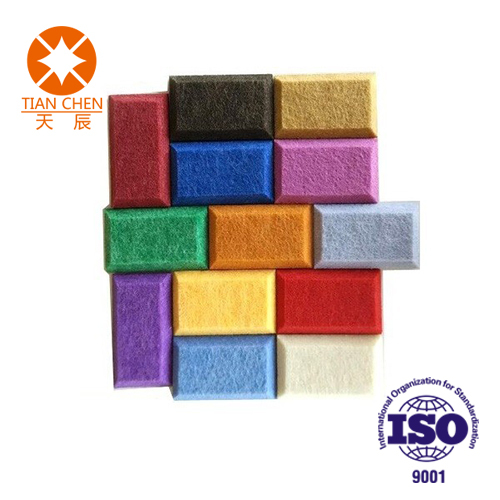 We offer you more than 20 colors for choice. You can also cut the Acoustic Board into any shape in your requirements. Public places like theaters, dance halls, Auditorium, multi-purpose hall, gymnasium etc. have high requirements on fire protection. Tested by National Fire Deception Testing Center, the Acoustic Board complies with the B1 grade requirements of GB8624-1997 standard. Thanks to its excellent physical property, Acoustic Board has no risk of falling and hurting people. Tested by National Research Center of Testing Techniques for Building Materials, Acoustic Board's formaldehyde release quantity is 0.1 and complies with the E1 grade requirements of GB18580-2001 standard. A materials ability to absorb sound is measured by its sound absorption coefficient and is often expressed in terms of a Noise Reduction Coefficient (NRC) The NRC is the arithmetic average of the product`s sound absorption coefficients at 250,500,1000 and 2000Hz. The sound absorption coefficients of products are measured according to ISO140-3. An NRC of 0.4 means 40 % of sound is absorbed by the material. Typical building materials such as plasterboard have an NRC of approximately 0.04 which means only 4% sound will be absorbed. The NRC of Our product is up to 0.85. Our product goes beyond the environmental benefits gained from the performance of its thermal insulation. The most obvious contribution to the environment of this panel is the improvement in the thermal efficiencies of buildings, which in turn greatly aids in the reduction of energy use and greenhouse gas production. Additionally, the production and the performance of our panel has been engineered to ensure the best possible environmental outcome. All offcuts and waste are immediately recycled back into the process or recycled into anything from plastic pallets to fence posts, which may also be recycled in the future. The installation of the panel is quite simple, customer can install it onto wall alone. We mainly use glue such as spray plus, hot melt adhesive glue, white glue, glass glue, etc (according to different surface) to stick our panel onto wall directly, but the key of installation is making sure that the surface of the wall is flat and smooth. For example, like flat concrete wall, you can install the panel directly with white glue, but for glue-saving and time-saving, you can use gun nail for assistance. SWAN LAKE warrants that for three years from the date of original purchase the above brands of acoustic panels coverings will maintain a serviceable surface. This three year wear warranty covers normal conditions of use generally accepted in the industry.SwanLake reserves the right to replace the affected room or area or refund the original purchase price on a prorated basis of life served of the wall covering for the affected area or room. This warranty does not cover tears, cuts, burns or damage due to improper use or lack of protection or the use of improper cleaning or maintenance methods or materials. Looking for ideal Home Theater Acoustic Board Manufacturer & supplier ? We have a wide selection at great prices to help you get creative. All the Soundproof Polyester Acoustic Board are quality guaranteed. We are China Origin Factory of Polyester Wall Acoustic Board. If you have any question, please feel free to contact us.